A pattern that I've been noticing that's been popping up a lot lately on both the arms and feet of the most stylish is snakeskin. In recent years, more an more snakeskin printed or textured pieces have been resurfacing and this season, it's been showing itself in entire collections, like those of Michael Kors. Although it's been trending more lately, I personally feel that it's a classic neutral print, like cheetah and leopard. At the same time, however, I do feel as though it has more of a seasonal feel to it, which is why I feel it's a print most commonly worn during the spring and summer, unlike the other animal prints, which are typically worn all year long. It's also a print that's a bit more daring, which I feel embodies the personality of the animal the print is inspired by. Have you noticed this, too?! 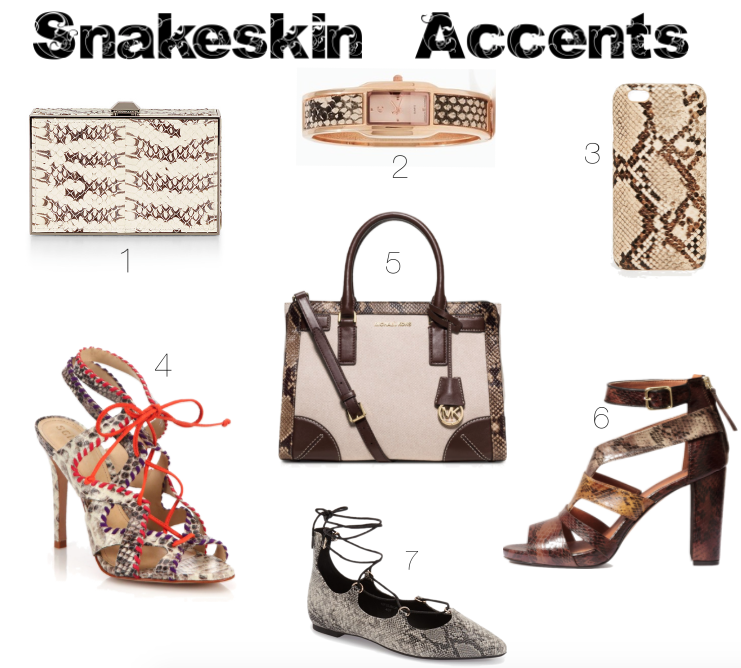 What's your favorite animal print and do you dare to wear snakeskin this season? Thanks so much for stopping by, beauties, and I hope your day is as lovely as YOU!